Posted on Tuesday, August 26th, 2014 at 3:33 pm. 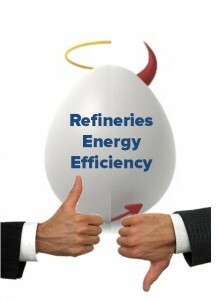 At the ERTC energy conference in May this year, Solomon Associates presented their latest Fuels Refinery Study. It showed that the annual energy expenditure at an average refinery in Europe and the Middle East was US$ 423 million – that’s nearly 60% of the total operating costs. In Asia/Pacific, the proportion of energy expenditure was even higher at nearly 70%. This will come as no great surprise to the industry; for many years improving energy performance has been one of refiners’ most important targets for maximising margins. The challenge is now greater than ever, with the additional pressure to reduce emissions of all kinds. What may be a surprise, though, is the range of performance exhibited by European refiners. For an equivalent processing task, the most efficient refiners consumed less than half of the energy of the least efficient. In other words, the energy performance of European refiners is like the ‘Curate’s Egg – good in parts but mostly not as good as it should be. There are many reasons for this range of performance. Asset utilization is a prime factor and we can infer that the current trend of capacity rationalisation should lead to improved energy performance, but which assets will survive? Will the Industry generate a virtuous cycle – energy inefficient assets shutting down leaving high utilisation for the energy efficient survivors? At Palmer International we work with refiners to develop and implement action plans to secure the future of our clients’ refineries throughout the World.